Plainfield Indiana is a Suburb just west of Indianapolis located about 10 minutes from the airport and 20 minutes from downtown Indianapolis, which makes commuting a breeze. Plainfield is a great place to own real estate, live and raise a family with 5 star schools, convenient shopping, great parks and recreation, and well sought after and desirable housing options. You will have plenty of things to do in Plainfield with over 12 miles of trails to run, bike & walk and several different parks to enjoy with your friends and family. 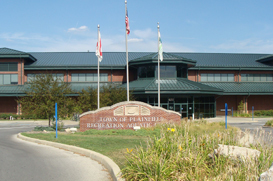 There is also the Plainfield recreation center which has a very large indoor outdoor water park, indoor basketball courts, volleyball, indoor track, exercise classes and much more. There is plenty of shopping and restaurants in the Plainfield area that you will be sure to enjoy. The Outdoor mall is full of shops, restaurants and an 18 plex Movie Theater with real estate in close proximity to it all. The Chateau Thomas Winery, located on the South end of Plainfield by the highway 70 exit is another great place to visit as they host many music and art exhibitions. You will love the Plainfield area, It is a great place to own real estate and call home. If you’d like a personal tour of the area feel free to contact one of our expert Realtors.